To further enhance diplomatic community-HSC exchange and cooperation, build up the brand name of the DRC cultural events and offer cultural diversity to the diplomats’ living in Beijing, under the auspices and support of the DSB-HSC executives, HSC organized the DRC Diplomatic Clientele Beidaihe Excursion 2017 from 18 to 20 August 2017. Some 100 senior diplomats with families, including 8 ambassadors, including Samoa, Papua New Guinea, Tajikistan, Mauritius and Latvia, from 27 countries took part in the event. Ms. Jiang Qi, deputy director general of DSB, Cui Yong, general manager of the Beidaihe Guesthouse for Diplomatic Missions (BGDM), Lin Li and Liu Yong, deputy general managers of HSC, accompanied the invited guests to the seaside resort. Ms. Jiang gave a dinner party to welcome the diplomatic envoys in the evening of 18 August at the BGDM and commented that HSC had seen thriving and astounding development and growth in recent years, as the newly accomplished Liangmaqiao Diplomatic Office Building, Jianwai Media Center and the upcoming Building 3 of Qijiayuan DRC were breathing new life into the DRC. Having endeavored ceaselessly to deepen and widen the DRC services, the newly founded DRC Affiliated Business Association was dedicated to offering all-inclusive and quality services to the DRC residents, being headed toward the objectives of modernization and internationalization to provide professional, diverse and better services. On behalf of the invited international clientele of the DRC, the Samoan ambassador delivered his speech to thank the HSC for organizing a relaxing and pleasant trip. 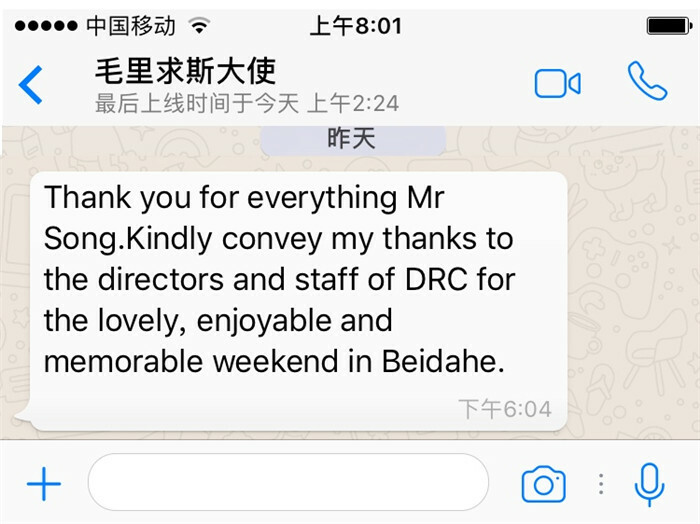 The DRC services delivered were professional and detailed, giving peace of mind to the diplomats at both work and home in Beijing. 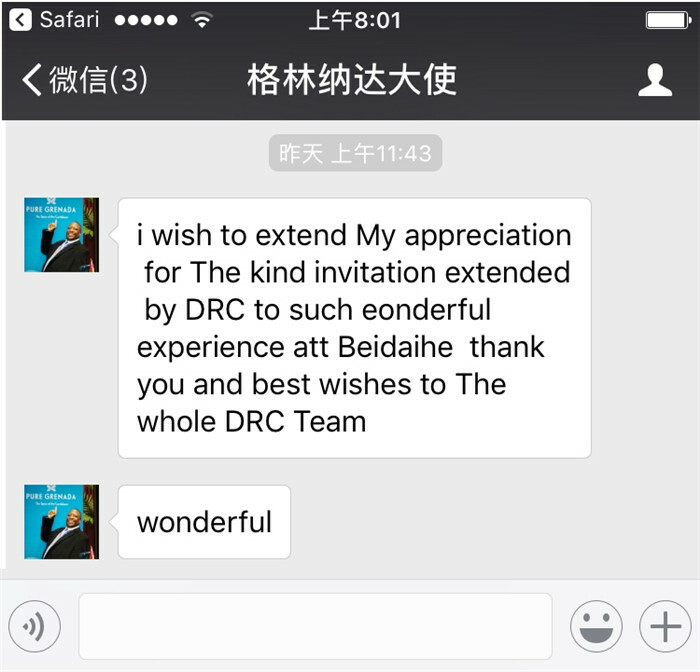 He congratulated the DRC for achievements made in the past years and hoped its brand name would continue to grow and be increasingly recognizable to the diplomatic missions and international organizations, making it possible for the expatriates to feel at home in Beijing. In the next morning, the excursionists toured the eastern tip of the Great Wall and the Qinghuangdao Safari. In the afternoon, the diplomats with families were invited to take part in the competition or watch the DRC Diplomatic Residents’ Table Tennis Friendship 2017, in which numerous visitors participated. 6 teams entered into the contest, including teams Japan, Korea and Russia. 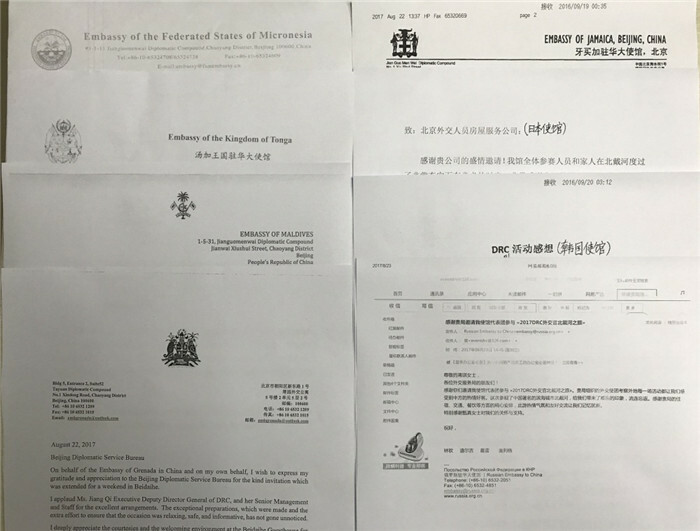 The international team was composed of employees of the embassy of Malta, Japanese Broadcasting Corporation (NHK) and AIIB. Also signed in were teams DSB and BGDM. Before the competition began, Ms. Jiang observed, being the national sport in China, table tennis opened the door to restoration of diplomatic relations between China and the USA in 1970s. The diplomats taking part in the excursion would have a chance to make new friends with their table tennis skills, following the time honored tradition. The contestants played hard to beat their opponents, drawing waves of cheers and applauses from the spectators. Nonetheless, the adversaries turned instantly into friends when the game was over. The ambassador of Grenada proclaimed, “It was table tennis that helped make diplomacy headways in the past and it is diplomacy that helps to boost table tennis expertise today.” Eventually, team Russia won the top prize, team DSB, the second, and teams ROK and BGDM shared the third places. 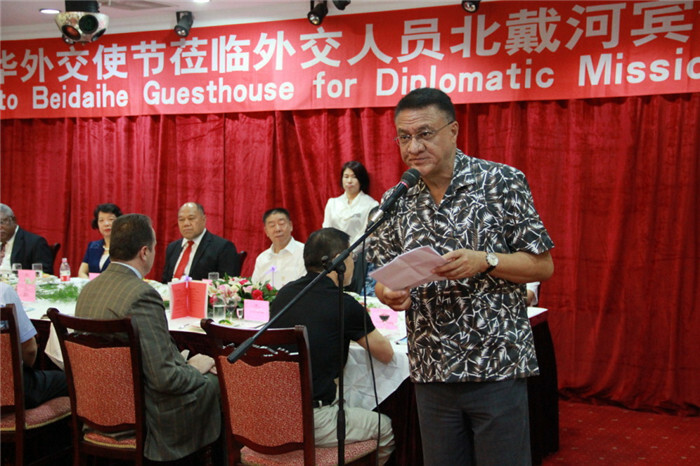 At the evening BBQ party, diplomats from the Japanese and Russian embassies showcased their vocal talents by singing classic folk songs and the cultural counselor of the Gabonese embassy delivered a Chinese number. The Samoan ambassador invited Ms. Jiang to join him to sing a traditional Chinese love song and DSB-HSC executives joined the PR and Sales staff to present a Chinese number that called for closer affinity between the diplomatic community and DRC. In the end, theSong of DRC, adapted and arranged by the ambassadors to China present at the event, gave a perfect finale, with profound goodwill for the DRC. Though brief, the weekend excursion to the seaside resort offered the diplomats heartening experiences to learn more about the Chinese culture, for deeper affinity with the DRC. The participants gave the organizer their appreciations in various ways, as over a dozen embassies, such as the Mauritius, Micronesian, Grenadian, Jamaican, Latvian, Japanese and Korean, sent letters to thank for the excursion, saying they all had a wonderful and memorable weekend at the beach and thanking teams HSC and DRC for organizing the tour. 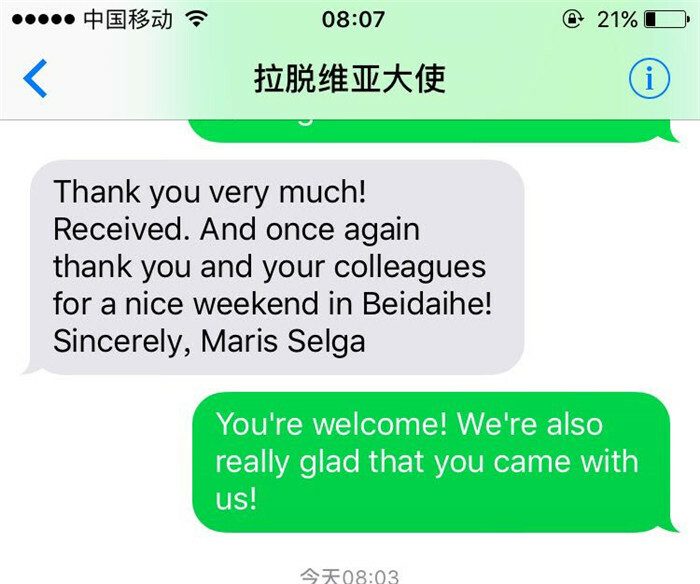 Team Japan remarked that all the table tennis competitors and families had a fulfilling and meaningful time at Beidaihe, as the contest was a life-enriching and friendship-boosting experience. Team Korea said that the excursion was a chance to learn about the DSB-HSC organizational prowess of dedication and meticulousness and enabled them to make numerous new friends. The excursion participants were deeply impressed with the thoughtful preparations, considerate services and efficient security arrangements, and looked forward to having more thrills like that in the future. 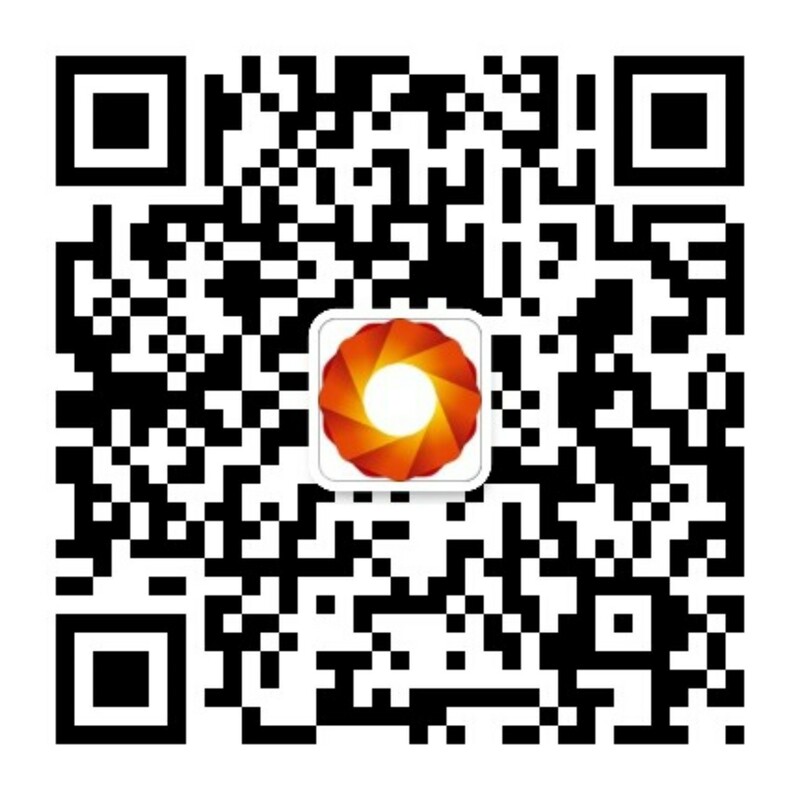 The success of the event owes tremendously to the support of the DSB-HSC leadership and cooperation from the BGDM, Jianwai and Qijjiayuan DRC Property Management and Fire Fighting/ Security Department, for which we would like to give our heartiest thanks. Previous：LCC Group Class in Sept., 2017 is enrolling!